Any equivalent IC for JCR4559? can you verify cut count. looks like there was one two holes below 4u7 but then removed from the bottom layout with cuts and jumpers. But it doesn't matter, that cut can go in either position and it will work fine. I'll correct the layout, thanks. assumed as much, just wanted to make sure it wasn't something I missed. Hoping to utter (type) those immortal words, "it's verified", later today. I will be using a B10 in place of the B5 Dynamics pot. don't have a 4559, but some of all the others listed. back to the iron. it's verified. I tried several 4558 and a LM1458, all sounded fine. 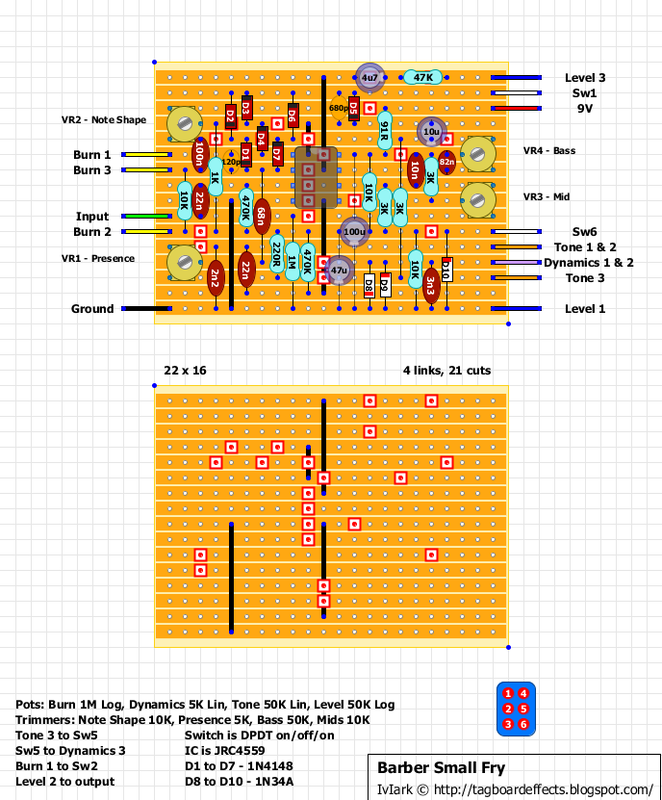 For what it is worth, I added an extra column at either end (wasn't really necessary) with the vision of hard wiring pots for external control of Shape, Presence, Mid and Bass. So far, adjusting the installed trim pots to taste seems to suffice. Based on the delicate nature of 1N34A's, I socketed D8-D10 in case of failures and also for some experimentation. D1-D7 are much more durable and were soldered in place. So far it sounds great! I really like the Dynamics control as well. Thanks for the layout and all you do, and so much for me thinking there was nothing left to build. What would be the best way to a/b the "phono style recovery" section of this circuit, in order to compare with other type? To see, you know, if that's just hype. Where can I find the schematic for this pedal, I've looked in all the usual places and can't seem to locate it?